Observed at Eldoret Kenya. January 2014. 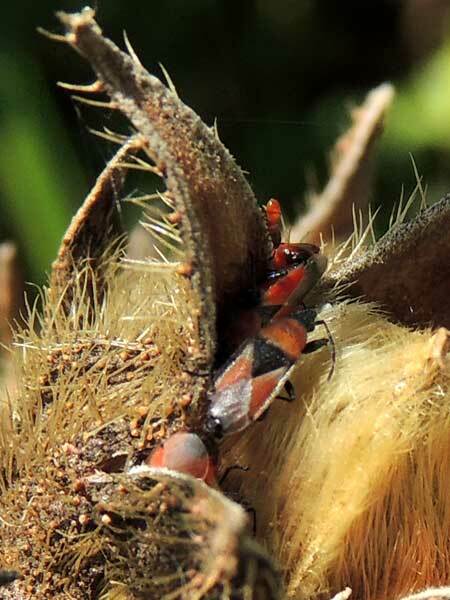 These insects are about 4mm in length and are aggregated on mature fruits of Swamp Hibiscus. Seed Bugs are a large group of many species that specialize in feeding on seeds. Some species go straight to the source, feeding from fruit capsules as the seeds are reaching maturity. Still others feed upon seeds that have already fallen to the soil. Seed bugs can emit foul-smelling chemicals that repell insectivores - the bright colors of many species like this one are probably a warning to that effect.